As always, I find this colour combination (Rhapsody in the Rain, so appropriate) totally beautiful and compelling and I want to knit with it right away. Also not slow! And yet. Remember when I got all excited because I had finally caught up with turning all my beautiful Vesper sock yarn into functional foot warmers, and I was now in a position to welcome each new installment in the club without guilt? Yeah, that's over. 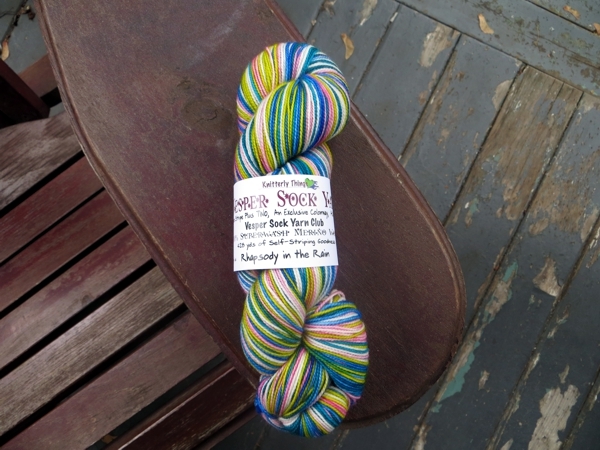 There are I think five more skeins of Vesper sock concealed in a magazine holder on the bookshelf where I conduct all my yarn winding, plus a pair of cakes waiting to be cast on, to say nothing of the two pairs still on the needles that have been housing them since - what, May? Plus longing - because we're having Vesper weather now and will do for the next two months, when it turns to Stoddart weather. Yes, I grade the seasons by sock weight now. If you knit socks compulsively you know what I'm talking about. And most urgently, insight. 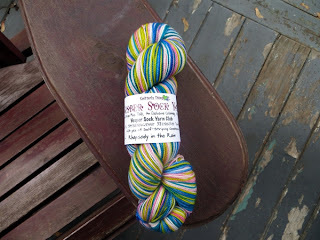 I was doing some seriously fast sock knitting there for a while; it was awesome and I got all caught up. Then suddenly it all changed. there is the definite fact that I turned away from double pointed square needles to Something Else. I've been knitting with several Something Elses for months and none of them feel really right in my hands, and I'm asking myself: Could this be a factor? I mean, honestly, with needles that felt like an extension of my brain impulses I was knitting fast socks, while with ones that have a series of disconnects between them and my fingers, I have slowed down. And then yesterday I was putting socks away. 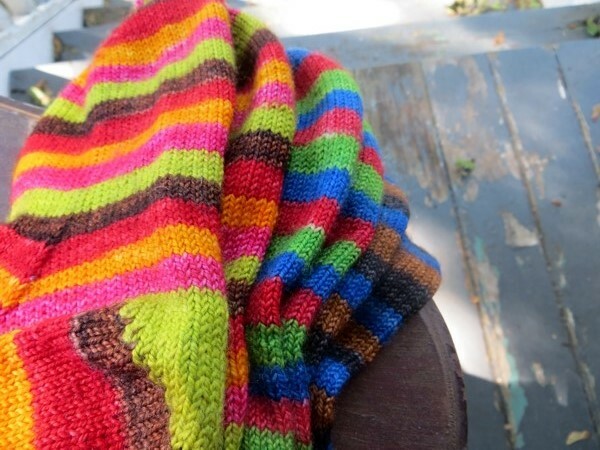 There is nothing like a handful of socks knit on the needles you rejected for reminding you that those socks were just fine thank you. Yes, the stitches were marginally bigger on the square needles I loved working with so much. Yes, those stitches didn't feel nearly as nice on my feet when the socks were done. The soles haven't worn out just because the fabric is a little less dense. The size of the arch on each one is absolutely perfect and non-squeezy. I think I might go back, when this round of socks are done. If I do that and then knit like the wind on the squares, there's just a chance I might catch up yet. You think? Not matter how many I cast off, I just don't have enough socks! I am so jealous right now. Of course, this time of year I'm gearing up to get the presents under control. Placemats for mom's dining table, Scarf for my aunt. Crocheted amigurumi for my daughter. Not sure about the rest, but I always try to give every family member at least one hand made item and I've received hints that some would like socks! What to do?! Making socks not for me is so hard. I just love them all so much. Thanks for the inspiration you provide! And for making me feel a little less guilty that I want all of the sock for me.